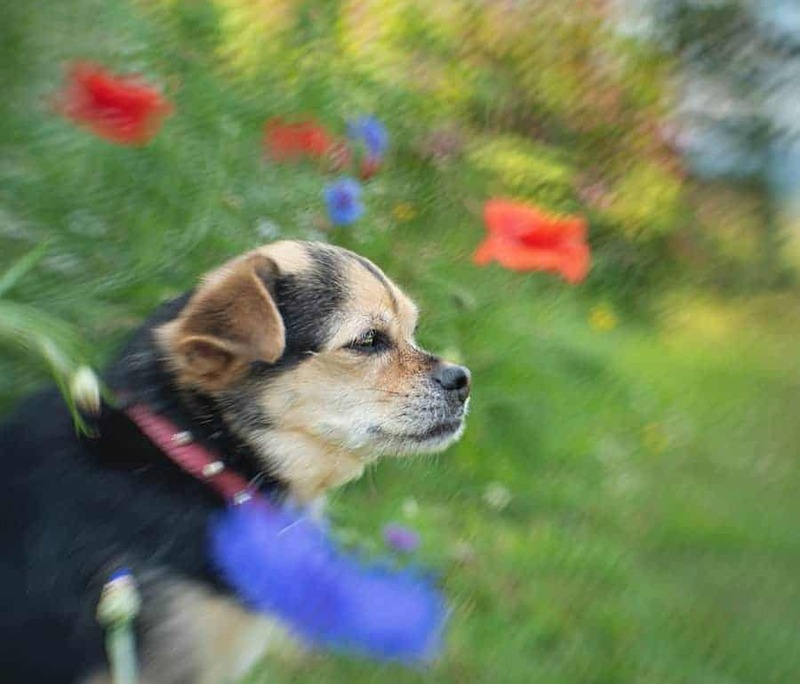 The new Lensbaby Sol 45 creates a background blur that looks like brush strokes, straight out of camera. Photo by Tracy Munson. Just how many types of blur are there? You might rightfully ask, and Lensbaby will respond “lots”. Their newest standalone lens, the Lensbaby Sol 45 was released today, and it takes creative blur to a whole new painterly level. I've had my hands on a beta model for several weeks now, and you can colour me impressed. If you've been on the fence about trying out a Lensbaby, there are several compelling reasons to make this your first one. The comparatively low cost is the first reason. Retailing for $199 USD, the Sol 45 is the most affordable of the standalone Lensbabies. It is priced more in line with the optics for their optic swap system but without the need to purchase the lens body to use it with. This is the lowest barrier to entry into the world of Lensbaby creativity that I've seen yet. I purchased my first Lensbaby as a new photographer and found it pretty frustrating. Using a fully manual lens when you don't have a proper grasp of shooting in manual mode with an automatic lens is like jumping into the deep end when you don't know how to swim. (But much safer). You will learn in a hurry, but not without some moments of panic! The Lensbaby Sol 45 takes some of the element of choice out of your hands by having an aperture fixed at f/3.5. If you use this lens with an Aperture Priority mode, the camera will choose your shutter speed, which means you just need to worry about selecting the ISO. Eliminating one of the factors makes it easier to use than other manual aperture lenses. Certainly, it is easier to use than the older Lensbaby optics that had magnetic apertures that you had to carry around and manually pop in and out of the lens. 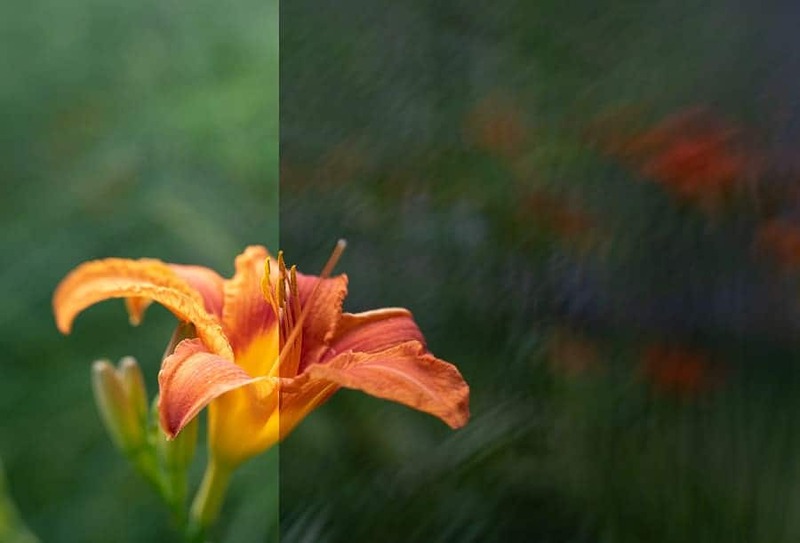 At first glance, a fixed aperture seems like an unusual choice, but upon reflection, I think most people use these types of selective focus lenses almost exclusively wide open, so it makes a certain kind of sense. If I want a tack sharp image from edge to edge, I'm going to use one of my Nikon lenses. Still, I'm a little bit on the fence about it. 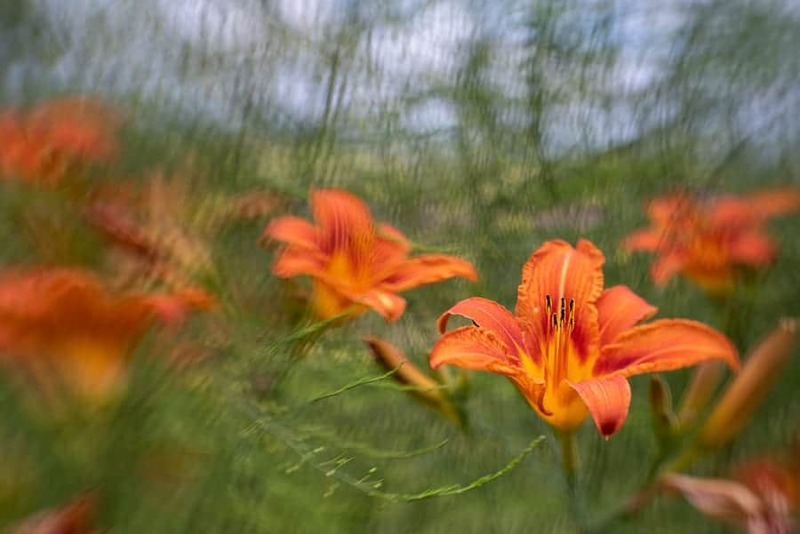 I frequently go for walks with just a Lensbaby Velvet, Twist, or Burnside lens in my bag, knowing that if I want to, I can stop down to f16 and capture a sharp image with little or no special effect. When have I ever used one of those lenses stopped down? Never. I just like to know that I could. Fortunately, the Sol 45's diminutive size makes it easy to bring along as a second lens, it is small enough to fit in a pocket. 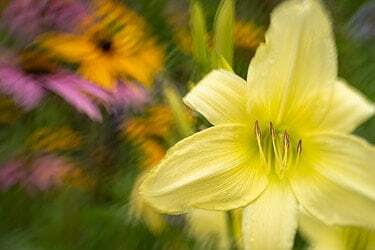 The painterly effect created by the Lensbaby Sol 45 might just make it my new go-to lens for photographing flowers. Photo by Tracy Munson. These are the creative effect aperture blades on the Lensbaby Sol 45. They can be opened or closed simply by pushing them over the front of the lens. Each lens in the Lensbaby lineup has its own superpower. The Sol 45's is the ability to create a background blur that looks like brushstrokes, straight out of the camera. This effect is created by closing a set of blades over the front of the lens. These “aperture blades” have a pattern cut out of them that affects the shape of the bokeh. (As an aside, this is a fun technique to experiment with. Cut a simple shape, like a star or a heart out of a piece of black paper. Attach the paper with the hole over the front of your lens and shoot with the widest possible aperture. Bright spots in your background will take on the shape of the cut-out. Cool, huh? Check out tip #3 in this article for an example.) The aperture blades are closed simply by pushing them in over the lens with your finger. You can experiment with closing them both all the way, part way, or close only one to achieve your preferred effect. Now, I'm something of a “blur junky”, but this painterly effect may just be my new favourite fix. I'm also a huge Photoshop addict, but most of the images I've created with the Sol 45 have plenty of cowbell, with little or no editing required! Oftentimes, creative bokeh effects are really only noticeable when there are bright spots in the background. I love that this effect is noticeable on any background that has some texture to it, even if it is fairly dark. Be aware of what you include in your image. Cloning out unwanted distractions can be extra difficult on a textured background like this. With the creative effect aperture blades open, the background has the nice, soft bokeh that you would expect when shooting with a wide open aperture. A comparison showing the effect of closing the aperture blades when using the Lensbaby Sol 45. Photos by Tracy Munson. Closing the creative effect aperture blades on the Sol 45 will decrease the light reaching the sensor by one full stop to f/5. You will have to compensate either by increasing ISO or exposure time or by bumping it up in post-processing. This is a “straight out of camera” example of the difference in exposure created by closing the aperture blades. Photo by Tracy Munson. The effect of the Lensbaby Sol 45 makes this photo look like a long exposure. Photo by Tracy Munson. Sometimes, the creative effect can add a real sense of motion to your photos. 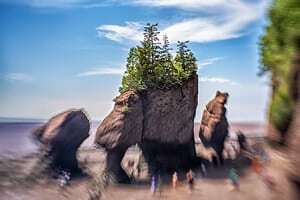 I found it useful recently while visiting the popular Hopewell Rocks in New Brunswick. There were so many tourists, it would have been virtually impossible to photograph the scene without people in it. Using the Lensbaby Sol 45 made this photo look like a long exposure, showing the people moving around. In fact, this was handheld, with the lens tilted upwards and a 1/500th of a second shutter speed! With the Sol 45, Lensbaby returns to their original bending and twisting style of selective focus. With this type of lens, you can bend and tilt the lens towards your subject and focus quite close to the edge of the frame. One of the biggest drawbacks to lenses like the Velvet series and Twist 60 is the inability to focus on subjects that aren't close to the centre of the frame. The Sol 45 makes it possible to compose your photos using the rule of thirds, to create more visual interest. 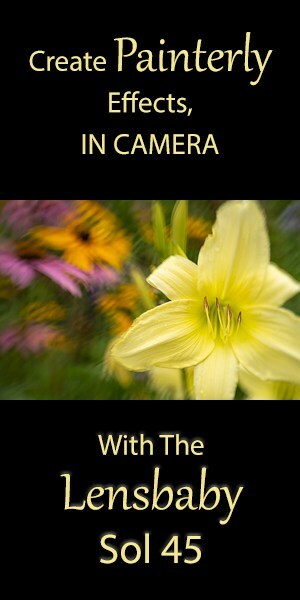 (If you are unfamiliar with the rule of thirds, check out this article). You can also control what you blur out, like the inconvenient tourists in the photo above. The lens is tilted using the rear ring, closest to the camera. Once your image is composed and you have tilted towards your subject, you select focus using the front ring. If you want to keep the circle of focus in the centre, you simply give the lens a twist to the left to lock it in place. 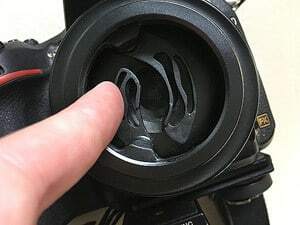 It's a good idea to do this when you put the camera away in your bag so that the lens isn't flopping around. One tip for using a manual focus lens is to make sure your diopter is in the correct position beforehand. On my Nikon D750, the diopter dial is quite loose and often gets jostled out of position. The diopter is a tiny dial next to your viewfinder and it allows you to customize what you see through the viewfinder to suit your eyesight. It is very difficult to set your diopter once a manual focus lens is on the camera. To adjust it, use an autofocus lens on a tripod. Focus on something in the distance. Does it appear clear to you through the viewfinder? If yes, then your diopter doesn't need to be adjusted. If no, then try using that tiny dial until it comes into focus. Now you will be able to achieve manual focus much more reliably. The fixed aperture of the Sol 45 captures a very shallow depth of field. Combined with the manual focus and relatively wide angle, it is a challenge for moving subjects like Becca, but when it works out, the results can be stunning. Photo of adorable pug mix by Tracy Munson. It will also be available in a 22mm version in September, for micro 4/3 shooters. (Equivalent focal length of 44mm). Crop sensor camera owners will be pleased that the Sol 45 will work well on their cameras, with plenty of creative effect. (Some Lensbaby lenses, like the Twist 60 and Burnside 35 have effects that are most noticeable around the edges, so a lot of the good stuff gets cropped off with an APS-C sensor. Not so with the Sol 45). The 45 mm focal length will be affected by the cropped sensor size and will function more like a 67-72 mm lens (depending on the crop factor of your camera). The all metal body is surprisingly compact and light at 143g (5oz) for Nikon and 166g (5.9oz) for Canon. It has a relatively flat profile and protrudes less than an inch past the handgrip on my Nikon D750. That means that when it's on, I can shove that camera sideways in my bag next to another camera, which I kind of love. Also, as I mentioned above, it fits easily into a jacket or purse pocket. The minimum focusing distance is 35.5cm (14 inches). This is not a macro lens, but it is wonderful for photographing larger flowers up close. The Sol 45 is a manual focus lens, f/3.5 – f/5 (with the creative effect aperture blades closed). The filter thread is 46mm. 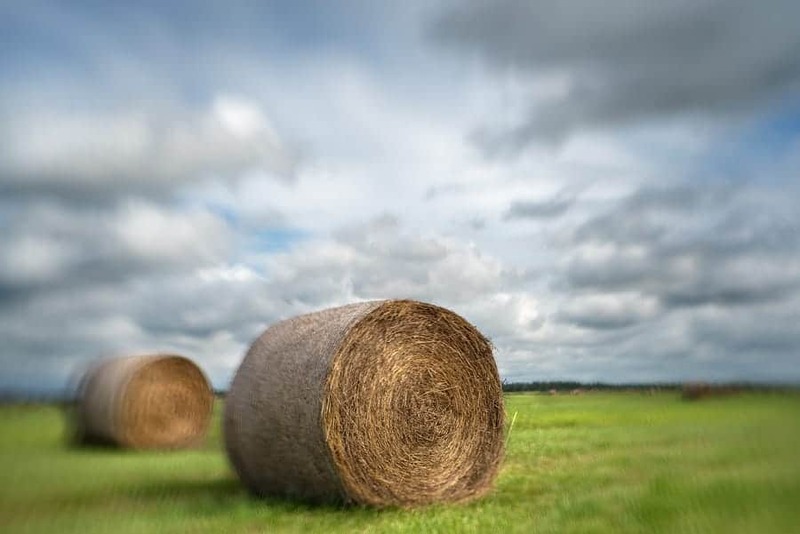 The Lensbaby Sol 45's shallow depth of field works well for landscapes with a well-defined subject. Photographed by Tracy Munson. Overall, my experience in beta testing the Lensbaby Sol 45 has been extremely positive. It seems like every new Lensbaby is my favourite, but this one is especially in keeping with my personal aesthetic. If I had one complaint about the lens, it is that the tilt mechanism on my copy is extremely loose and floppy. I have to hold it in place, it won't just stay where I point it, as my Composer body does. Hopefully, that is just an issue with the beta models and will not be a problem with the final product. *Article updated to add a Lensbaby representative's response to this issue: “we had a part for the beta units that came in at the wrong size and we had to tweak it manually to fit…and the result with several beta lenses was that they loosened up over time. This will absolutely NOT happen with the production unit as those have the properly sized internal part.” Great news! With the Sol 45, the folks at Lensbaby are trying to target newer photographers who will appreciate the pared down simplicity of the lens. They are also hoping to appeal to more experienced photographers who may have been on the fence about trying out a creative effects lens. Presumedly, the $199 price point will be appealing to both groups. The focus (pun intended) of this lens is meant to be playful and fun, and I believe it succeeds in being laid back and easy to use. Personally, I love the way Lensbaby always help me to see, think, and shoot in new ways. *Lensbaby provided me with a complimentary beta version of their lens to use for this review, but I have never promised them a positive review in return for a product. These are my honest opinions of this lens, and I would have happily paid full price for this lens and been a very satisfied customer.